Have you ever watched a war movie where flares and other illuminating devices were used to light up a nighttime battlefield? I remember long ago watching a Korean war movie and the North Korean army were sneaking up on our soldiers at night enticing them to come out of their foxholes but when our men illuminated the battlefield with flares the recognized the enemy and took action against them. It is unsettling to think about the dark side of life I would much rather think about the lighter side of life. Writing from experience one of the dangers we face when thinking about the dark side of life is we have a tendency to get caught up in our own ability to overcome the darkness. However, when we come to depend on our own light as Isaiah writes doing so is never a good thing. “But watch out, you who live in your own light and warm yourselves by your own fires. This is the reward you will receive from me: You will soon fall down in great torment.” (Isaiah 50:11, NLT) And out of my experience with walking in my own light I have learned when the dark side of life is exposed to and by the Light of Jesus, it becomes a blessing of light, Jesus’ Light. The Psalmist writes about his struggles against his enemies. “Though I am surrounded by troubles, you will protect me from the anger of my enemies. You reach out your hand, and the power of your right hand saves me. The Lord will work out his plans for my life— for your faithful love, O Lord, endures forever. Don’t abandon me, for you made me.” (Psalm 138:7–8, NLT) Like the Psalmist there are times when our lives become a battlefield and we find ourselves in life-to-life combat not with enemies of flesh and blood but emotional, mental, physical, and spiritual enemies. Since they love to come at us under the cloak of darkness we need the Light of Jesus to not only illuminate them but to fight alongside us as well. 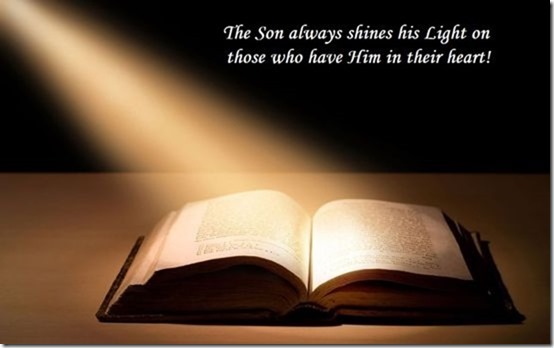 And the Son always shines his Light on those who have Him in their heart!